White truffle oil adds delicate flavor to many dishes. It's best used with cold dishes such as salads, although it can be added to many cooked vegetable, pasta and egg dishes as well. White truffle oil is made from olive oil and truffles, a type of fungi that grows throughout Europe, Asia, North America and North Africa. There are many types of truffles used to make truffle oil, but the one best known to gourmet cooks is the white truffle. Most gourmet cooks believe that the best white truffles hail from the Piedmont area of Italy. The Piedmont area is in the north just at the foot of the Alps. The best known truffles come from a town called Alba, which means "white." The busiest months for truffle sales in Alba are October and November, when truffle hunters gather to sell the delectable fungi. White truffles can sell from $1,000 to $2,000 per pound, making them very expensive to purchase whole. Another good type of white truffle comes from Oregon, in the northwestern United States. Other areas, including Croatia, produce fine truffles too. In traditional gourmet cooking in France and Italy, chefs make their own truffle oil. White or black truffles are sliced very thin and placed in jars or bottles of the purest olive oil. The earthy, rich flavors of the truffles infuse the olive oil and lend it the special taste purists know as truffle oil. However, most truffle oils are actually synthetically flavored olive oil. An additive by the name of 2,4-dithiapentane can create a truffle-like flavor in olive oil. Many commercial restaurants even use this inexpensive substitute, since the average diner cannot tell the difference between gourmet truffle oil and olive oil flavored with 2,4-dithiapentane. Not all truffle oils are created equal. True truffle oils that are actually flavored by the fungi themselves may use black or white truffles, so check the label. Each lends its distinctive flavor to the oil, and most chefs prefer white truffle oil over black. In addition to the different types of truffles, inexpensive brands may contain no real truffle flavoring at all. Purists may object, but novice chefs seeking an inexpensive alternative to pricy oils can use many of these inexpensive flavored oils. Most chefs prefer the taste of white truffle oil, claiming it has a milder, earthier, and more complex flavor than black truffle oils. For many people, it's simply a matter of preference. And while purists prefer gourmet white truffle oils made with real truffles, the average diner cannot tell the difference between flavored olive oils and actual truffle oil. Chefs recommend several uses for truffle oil. Most use it on cold dishes such as salads, or added at the end of cooking to enhance flavor. It is almost never used to fry foods, as the coveted truffle-taste doesn't last through high heat. Many recipes for dressings and vinaigrettes call for the complex, earthy flavor of truffle oil. Truffle oil pairs well with vegetables such as asparagus and potatoes. A dash of truffle oil in mashed potatoes adds a sublime taste that's unparalleled. Another favorite way to use truffle oil is to season eggs. Even simple dishes such as scrambled eggs benefit from a tiny dab of truffle oil. Add only a little bit to enhance the flavor, and add it at the end of cooking to avoid prolonged heat. Truffle oils are also used to enhance various breads and pasta dishes. Crostini brushed with truffle oil glistens with pleasurable crunch and complex flavor in every crunch. Everyday foods such as pizza can be drizzled with truffle oil for a gourmet touch. Many pasta dishes benefit from a drizzle of truffle oil before tossing with Parmesan cheese and herbs. Purchase genuine truffle oil at gourmet food stores nationwide or through online sources. Inexpensive, synthetic truffle-flavored oils may be found at many stores such as Trader Joe's and large supermarkets nationwide. Expect to pay $8 or more per bottle for synthetic truffle oils and $15 and up for genuine truffle infused oils. Truffle oil should be stored in a dark, closed container. It tends to spoil quickly. Use truffle oil within a few months of purchase. 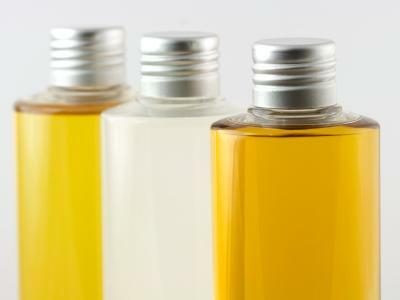 Rancid or off-tasting oils should be discarded, since the flavor cannot be recovered once the oil has gone bad.